A Splendid Messy Life: Stella & Dot GIVEAWAY! I'm in full holiday shopping mode at my house right now. I like to do most of my Christmas shopping online because I find it just so super easy, especially with a 1 year old at home, and most places I shop have free shipping - done. Last week I posted about hosting a Stella & Dot party and gushed over many of their pretty pieces, and I am placing a Stella & Dot order this week for a few last Christmas gifts. As I was browsing their website for the millionth time, I decided to pick up one of these and will put a gift card inside for our housekeeper. Then I also decided I really wanted to do my first giveaway on the blog this holiday season. So, it's your lucky day! 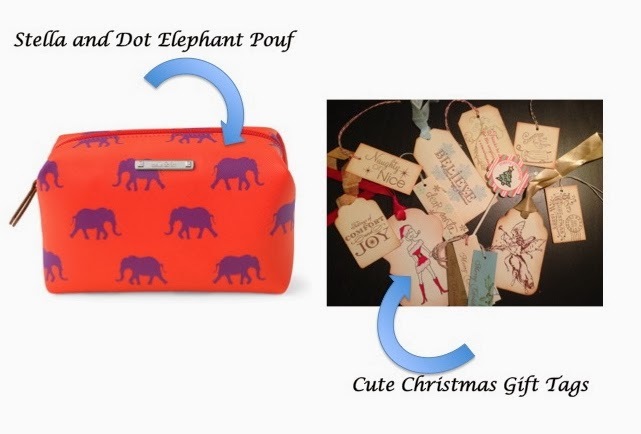 I'm giving away the elephant pouf pictured below to one lucky reader, and so it doesn't arrive empty, I'm going to add some cute Christmas gift tags inside for you to use while wrapping your gifts. Comment below and tell me what you would put in this little bag? Mom or not, I think there are a ton of uses for it. Let me know in individual comments for each bonus entry you did! *While I will send the pouf out to the winner asap, I can't guarantee it will arrive before Christmas, so plan to keep this treat all for yourself!